Many people complain about skin discoloration. In fact, white spots on the face are a common beauty concern for many. This skin condition stems from a decrease (or absence) of melanin in the skin, which is the pigment responsible for our skin and hair color. The discoloration can begin at any age, but the usual age of onset is the mid-twenties. White spots can occur from a variety of factors and can affect people of all races and skin color, yet the discoloration tends to be more pronounced among darker-skinned individuals. There’s also an autoimmune condition called vitiligo, wherein your body makes antibodies that attack your pigment cells, resulting in a complete loss of melanin in the area of the affected skin. Whether small or big, white patches on the face can sprout serious self-esteem and confidence issues. Even though this condition is not life-threatening or contagious, it can give rise to a lot of psychological and emotional stress. Can White Spots be Cured? There can be a number of reasons behind the development of white spots on your face. White spots occur due to a decline in the melanin-producing cells in the body. Melanin is a natural pigment that is responsible for the color of your skin and hair. If there is a complete loss of melanin, vitiligo can result. Some white spots also can be due to sun exposure, fungal infections, or certain nutritional deficiencies in the body. 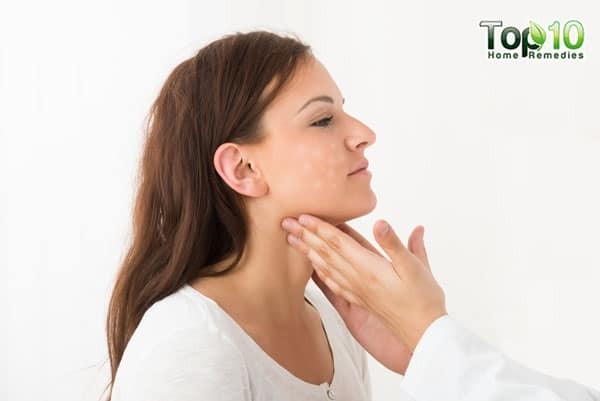 Eating too much junk food, sudden emotional stress, too many toxins in the body, excessive use of antibiotics, and improper health hygiene can also result in the development of white patches on the body, including the face. White spots on the face look paler than the surrounding skin. In some cases, there may be itchiness, too. Aside from the face, white spots can also occur on the hands, back, and other parts of the body. Despite ongoing research exploring the very cause of white spots, there is still no sure-fire way to prevent its occurrence or stop it from spreading. In some cases, the discolored patches resolve on their own. In the event that the condition persists or progresses, doctors can prescribe treatments that might help even out the skin tone. While these treatments help manage the problem by diminishing the discoloration, different patients respond uniquely. Aside from the varying degrees of success of these treatments, another factor to bear in mind is that their positive effects are more or less temporary and cannot always curb the spread of the condition. The treatment for vitiligo is primarily concerned with minimizing the appearance of white spots by restoring the skin color. Your GP will take into account your age, overall health, the extent of discoloration, and the area of the skin affected before recommending a viable treatment option for your case. It is important to bear in mind that some of these treatments come with negative side effects and all of them do not yield the same results for everyone. In fact, the outcome of a specific treatment can vary from one body part to another. People with very fair or pale skin and those with only a small patch of vitiligo can do without any treatment at all. In most cases, white spots on the skin are not a matter of concern. However, it is recommended to see a doctor for a proper diagnosis of the reason behind the development of white spots on the skin. In fact, consult a doctor immediately if the white spots spread or don’t respond to any kind of treatment. If you are starting to notice white spots on your face, there is nothing to be worried about. You can use home remedies to deal with the problem. Here are a few home remedies to get rid of white spots on your face. Whether you have white spots due to idiopathic guttate hypomelanosis, vitiligo, or another cause, the primary treatment starts with protecting your skin from harmful UV rays of the sun. This is because the sun preferentially tans the surrounding skin, making the lighter spots appear more visible. Furthermore, because of the lack of pigmented protective cells, lighter skin will burn more easily. Sun protection is recommended by the American Osteopathic College of Dermatology. The American Academy of Dermatology also states that anyone who suffers from vitiligo can benefit from sun protection. For sun protection, use a sunscreen with SPF of 30 or higher, and choose one that is water resistant. Apply sunscreen to the exposed skin area at least 15 minutes before going out. You need to reapply sunscreen every two hours. Aside from using sunscreen, protect your face from the harsh UV rays of the sun by wearing a wide‐brimmed hat. 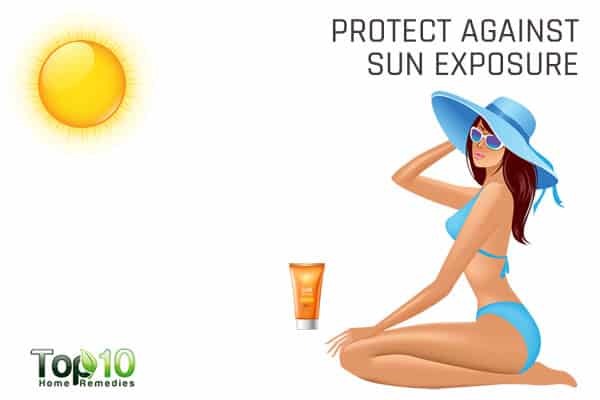 In addition, do not use tanning beds or sunlamps. 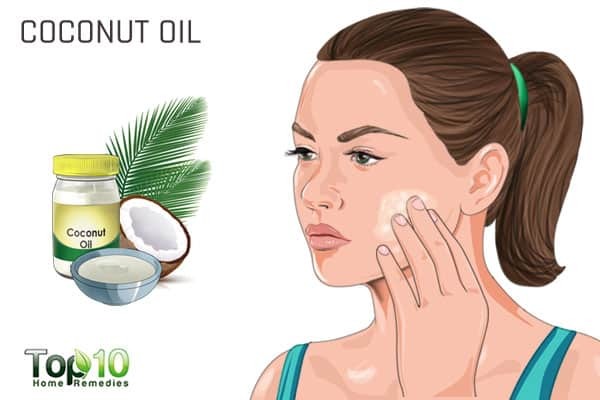 The all-purpose coconut oil is beneficial for different skin problems, including white spots on the face. It has re-pigmentation properties that may help reverse white skin spots. A 2015 study published in Evidence-Based Complementary & Alternative Medicine reports that virgin coconut oil works as an excellent emollient and natural antibacterial agent, in addition to demonstrating anti-inflammatory activity. The medium-chain fatty acids in coconut oil work as natural fungicides; thus, the oil can help treat tinea versicolor also. Coconut oil is also an effective remedy for eczema, another common cause behind white spots. Apply extra virgin coconut oil directly on the white spots several times a day. Also, include 1 to 2 tablespoons of extra virgin coconut oil to your diet. You can add it to your coffee, tea, soup, or other drinks. 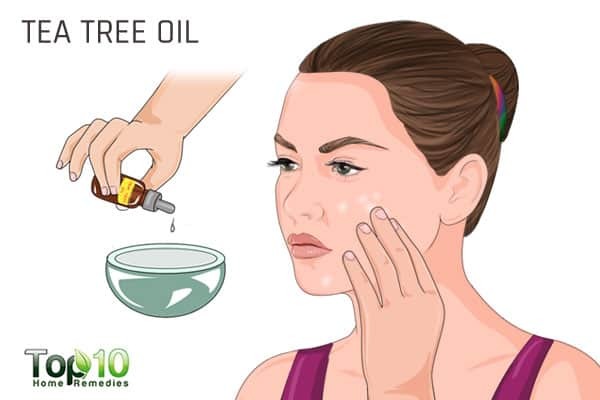 Tea tree oil is an effective home remedy for white spots on the face that may have developed due to tinea versicolor. It has antifungal properties that inhibit the spread of the infection and prevent a recurrence. Tea tree oil also provides relief from itchiness. Mix 4 or 5 drops of tea tree oil in 1 tablespoon of extra-virgin olive oil. Apply this oil blend to the affected area using a cotton ball. Copper aids in the production of melanin. Copper is needed by the enzyme tyrosinase for the synthesis of melanin from tyrosine. Hence, copper is beneficial in the treatment of white spots on the face. Pour drinking water into a copper vessel and let it sit overnight at room temperature. 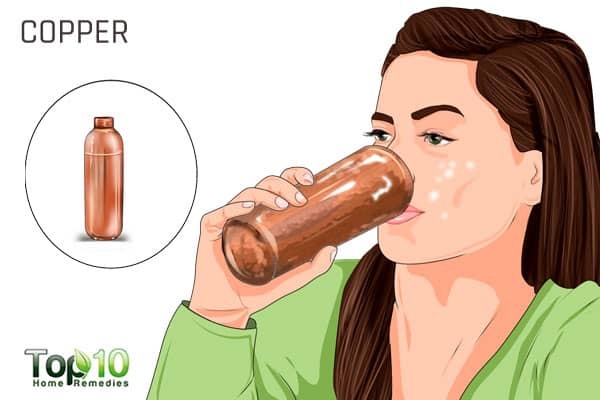 Drink this water on an empty stomach in the morning. Repeat this daily until you see improvement in your skin tone. Note: Do not place this water in the refrigerator, as it will destroy all the properties of copper that the water takes on. 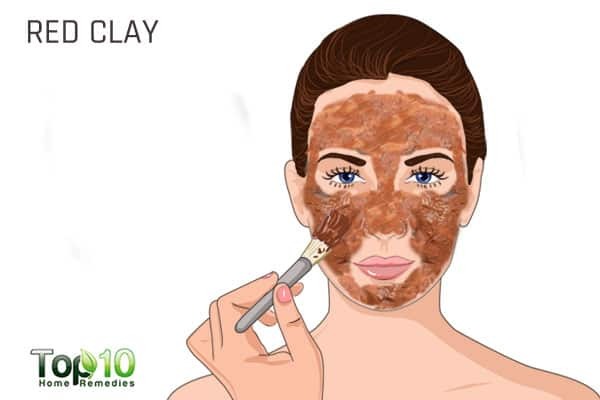 Red clay is also beneficial for treating white patches on your face. It has high copper content that helps restore the melanin in your skin. In fact, in Ayurveda, red clay is commonly used in the treatment of white spots. Put 1 tablespoon of red clay in a bowl. Add 1 tablespoon of ginger juice and mix thoroughly. Allow it to dry completely, and then wash it off and pat your skin dry. Repeat this daily for a few months. Nutritional deficiencies, especially vitamin B12 deficiencies, can lead to vitiligo, one of the common causes of white spots on the skin. Due to the lack of vitamin B12 in the body, there is an increase in the oxidative stress on the skin. This ultimately leads to a loss of pigmentation. So, if you are diagnosed with vitiligo, increasing your intake of vitamin B12 can help a lot. In a study, researchers concluded that vitamin B12 and folic acid supplementation combined with sun exposure can help improve the skin condition. Consume foods rich in vitamin B12, including liver, milk, cheese, eggs, and meat. You can even take a vitamin B12 supplement but only after consulting your doctor. Ginkgo biloba is a good remedy for vitiligo-related white spots on the skin. The flavonoids in it prevent oxidative damage at the cellular level and, thus, aid in the improvement of vitiligo symptoms. In a 2011 study published in BMC Complementary and Alternative Medicine, researchers found that ginkgo biloba supplements, when taken by vitiligo patients, improved their symptoms. You can take 40 mg to 80 mg gingko biloba supplements twice daily. Consult a doctor for the correct dosage. For any kind of skin problem, eating a healthy diet is a must. A skin-friendly diet can help maintain healthy skin and restore its glow and beauty. You need to eat foods rich in antioxidants such as fresh fruits and vegetables to fight free-radical damage. A diet high in vitamins C, A, E, and B also helps maintain beautiful and flawless skin. Also, eat foods rich in omega-3 fatty acids, such as sunflower seeds, avocado, salmon, and walnuts. Eating more dark and pigmented vegetables such as beetroots, carrots, and spinach can also help a lot. Plus, include water-rich fruits and vegetables in your diet, as they help hydrate the skin gradually and naturally as well as deliver nutrients. Last but not least, drink plenty of water daily to help your body flush out harmful toxins. Vitiligo patients can benefit from applying aloe vera gel or honey on the affected area. Vitiligo patients can also rub bavachi oil on the depigmented skin. You can conceal the white spots using makeup to improve the appearance of your skin and help you feel better about yourself until the pigment has been restored. Use unscented emollients with no dyes to prevent dry skin that may lead to pityriasis alba. Drinking papaya juice may possibly help to boost melanin production in your skin. Manage your stress level, as stress can cause dry skin, dullness, breakouts, and uneven skin tone. Exfoliate your skin once per week to prevent accumulation of dead skin cells, which can make your skin look dull and uneven. Choose your skincare and cosmetic products wisely. Vitiligo. National Institute of Arthritis and Musculoskeletal and Skin Diseases. https://www.niams.nih.gov/health-topics/vitiligo#tab-symptoms. Published October 19, 2018. Palmoplantar Pustulosis – American Osteopathic College of Dermatology (AOCD). https://www.aocd.org/page/IdiopathicGuttateH. Vitiligo. Employment and benefits | American Academy of Dermatology. https://www.aad.org/public/diseases/color-problems/vitiligo#tips. Goddard AL, Lio PA. 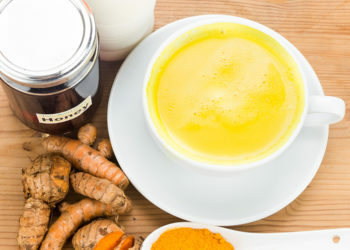 The alternative, Complementary, and Forgotten Remedies for Atopic Dermatitis. Evidence-Based Complementary and Alternative Medicine. https://www.ncbi.nlm.nih.gov/pmc/articles/PMC4518179. Published July 2015. C. F. Carson, K. A. Hammer, T. V. Riley. Melaleuca alternifolia (Tea Tree) Oil: a Review of Antimicrobial and Other Medicinal Properties. Clinical Microbiology Reviews. https://www.ncbi.nlm.nih.gov/pmc/articles/PMC1360273/. Published 2006. Gadi Borkow. Using Copper to Improve the Well-Being of the Skin. Current Chemical Biology. https://www.ncbi.nlm.nih.gov/pmc/articles/PMC4556990/. Published 2014. Soni P, Patidar R, Soni V. A Review on Traditional and Alternative Treatment For Skin Disease “Vitiligo.” Research Gate. https://www.researchgate.net/publication/228629265. Published January 2010. Juhlin L, Olsson MJ. Improvement of vitiligo after oral treatment with vitamin B12 and folic acid and the importance of sun exposure. Current neurology and neuroscience reports. https://www.ncbi.nlm.nih.gov/pubmed/9394983. Published November 1997. Ginkgo biloba for the treatment of vitiligo vulgaris: an open-label pilot clinical trial. BMC Complementary and Alternative Medicine. https://www.ncbi.nlm.nih.gov/pmc/articles/PMC3065445/. Published 2011. Namazi MR, Leok GOHC. Vitiligo and diet: A theoretical molecular approach with practical implications. Indian journal of dermatology, venereology, and leprology. http://www.ijdvl.com/article.asp?issn=0378-6323;year=2009;volume=75;issue=2;spage=116;epage=118;aulast=Namazi. Published 2009. I WILL TRY THE COCONUT TREATMENT. IF SUCCESSFUL THEN I WILL TELL YOU. THANK YOU SO MUCH? I will try coconut oil or ginger juice . If it works than I will tell you .